Landis+Gyr now offers software for automatic meter reading over the internet: iMEGA. This interface guarantees shorter reading times and lowers communication costs. iMEGA is the interface between a meter and an automatic meter reading (AMR) system. It is almost like a telephone book for AMR as it manages a list of dynamic IP addresses of internet-connected meters. iMEGA is an important security component in the overall system as it does not permit access to a meter without a valid code, and iMEGA software does not store any meter data. Landis+Gyr has developed new communication units for connecting meters to a Wide Area Network (WAN). The communication units provide WAN access optionally via GPRS (mobile phone) or directly via an ethernet connection. Since existing meters can be upgraded with internet metering, new meters do not need to be installed. Until today, remote meter reading systems acquired meter data using modems and telephone lines. The new communication modules from Landis+Gyr enable meter data acquisition via WAN (internet). The Landis+Gyr AMM System, Converge, is fully interoperable with Gridstream iMEGA and allows you to benefit immediately from all advantages of the Internet Metering Solution iMEGA. 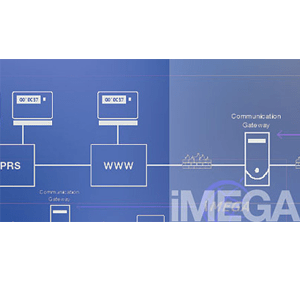 All meters are connected to iMEGA using either GPRS modems or directly to the network (internet). The meter registers itself with the communication gateway which updates a list with all meters connected on the internet. The AMR system connects to these meters using the Com Port Client and acquires the meter data through the network.